... making something useful and needed - storage shelves. DMIL left behind a very shabby and very old china hutch/base unit - once held together with screws and nails and glue and tape, once housed pretty china and ornaments, and now for years has leaned against the cement wall in the carport, loaded with paint tins, junk stuff, bits of metal and wood ... and I did not take a before picture, the project started before I was ready. Last day before school went back in session DH hauled up from the carport a very old, lots of wood edges turned to wood dust, much worn and abused hutch top. Doors sagged and had long slunk away to hide. Hinges were rusted, missing, useless. 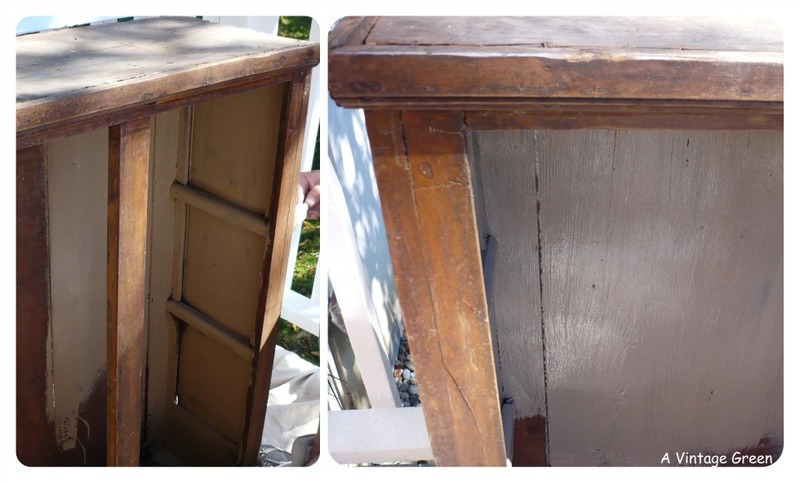 The hutch top had sat out in the carport for three years loaded with 'stuff'. Too heavy to easily move. Bones were good though. The need we had was for somewhere to store stock as it came in the house and we were very tired of having all the kitchen and living room surfaces covered with 'stuff' before it was cleaned/written up/packed for our booth. 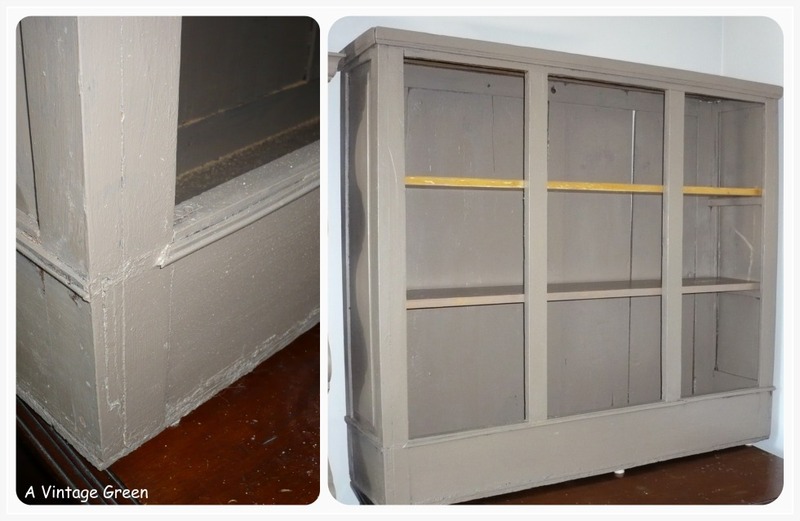 Painted the wood the brown/grey oil based paint previously used for our kitchen welsh dresser and knobs. 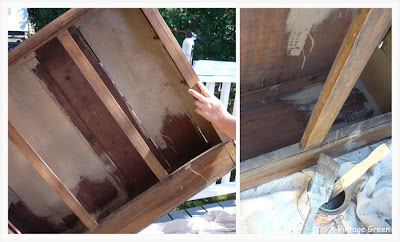 Two coats - the wood was very thirsty. We had picked up a double board oak plywood shelf free curbside last fall and DH took it apart, cut the wood to fit/notched the back to fit over the inside frame, sanded and painted the boards. Second paint coat was added after the shelf frame was in the house with the shelves installed. The paint dried in well. The finished project is full of stock waiting to be made ready for our booth and the tables and counters are now cleared for use. Hope that lasts. Contemplating putting the centre door back sans glass avec punched patterned tin insert. We'll see. Have you been able to reinvent something useful for no cash outlay? I would love to read about your project(s). 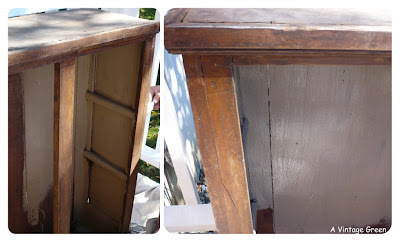 Postscript Sept. 12th - we have the hutch base (and all the doors and bits of cracked/worm eaten wood all stacked inside the base) just waiting to be repurposed - the 'repair' part of the job is going to be the hard part - very battered and worn out - something to look forward to. Not lately. But I'd sure like to come across a table for my little blue house dining room. I absolutely LOVE that color of paint!! Care to share the brand and name?? That turned out great and I like the color. I love being able to reuse, recycle or repurpose things. 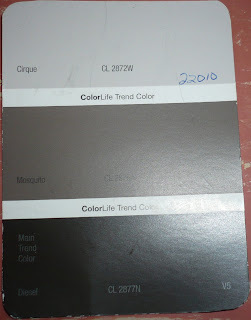 I found the paint swatch - the color is Cirque CL2875A, egg shell Premium Alkyd and is from General Paint. 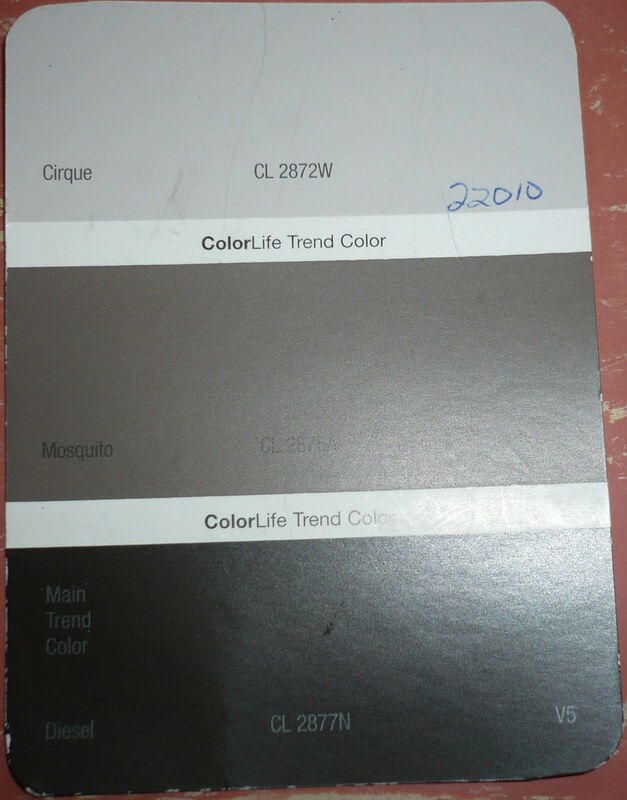 It looks dark brown on the swatch and is called Mosquito. I've added a picture which is 'almost' true but the flash did lighten the color a bit. ignore the color word Cirque- replace it in your mind with Mosquito. I need to edit my comments before I click on Post. Nicely done! There is nothing better than a 100% free find transformed into something beautiful and useful. 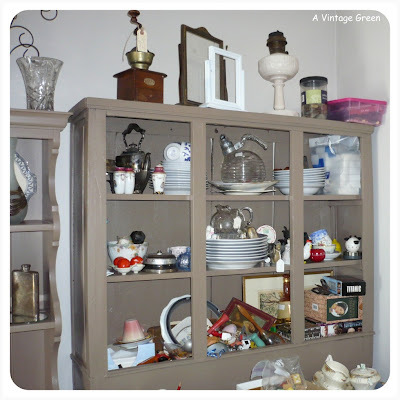 Great idea..I had to go buy (gasp) Billy bookcases from ikea....so tired of it ..as you say...on top of everything!